New installation video is coming! -Removed support for .GUN file within the mod (ingame). The mod will only load GUN2 files. 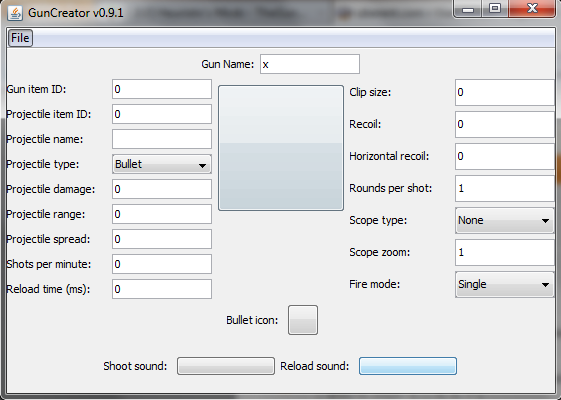 In order to convert your .GUN files to .GUN2, open the .GUN files in the GunCreator and save them as .GUN2 files. -Added support for custom weapons that can be created by myself. Look for some in the future! [size=small][font=lucida sans unicode,lucida grande,sans-serif]Q: How do I create a gun? [size=small][font=lucida sans unicode,lucida grande,sans-serif]Q: Where do I put my .GUN2 files? A: Place the .GUN2 files in your ".../.minecraft/heuristix/guns/" directory. Q: How do I zoom in (or use my scope)? A: Press the "z" key. Q: How do I reload? A: Press the "r" key. Q: Why is my game crashing when I __________? A: Your game could be crashing for a variety of reasons. Most likely, there is some sort of error with the mod that will need to be fixed. Before posting, try reinstalling the mod in a fresh minecraft.jar. Make sure you are updated to the latest version. If that does not work, go to your ".../.minecraft/heuristix/" folder. Open the file called "log.txt". Then go to your ".../.minecraft/heuristix/guns/" folder. Open the file called "log.txt". Copy and paste both logs into a post on this thread so that I can see what is happening. Note: recoil is still being tweaked. It's implementation at the moment is very simple and does not work well. When creating guns I would suggest not adding recoil until I get around to a better system. How would you obtain this gun in game? If you were to create a gun it wouldn't be put into the mod till it went through you? It sounds like a nice way to edit the properties of a nice already made gun mod and less of a gun creating mod. You may be looking for the download link in the top right (like on adf.ly) but on adcraft the download link appears in the middle of the page after a certain amount of time (5ish seconds). This needs allot of work before it can become pratical your aiming at non mod creators to create guns. Its just crazy to ask them to do all the work the gui dosen't help much at all. I am working on a set of basic guns that people can use, but obviously the main point of the mod is so people can customize their own weapons. In a few days I'll release some skins and sound files people can use and a few more guns. If you have any suggestions to increase the usability of the GunCreator then feel free to suggest them. Would you prefer a more "artsy" (if you will..) GUI? Ill Probably check this out soon. ok, so when i click the link, it goes to adcraft. there between two square ads towards the bottom of the screen, there is a countdown, when it finishes DOWNLOAD appears, but i click the word and nothing happens, the computors not blocking the site so i dont really think i have a solution. i believe ive used adcraft before for somthing else? can you make a mirror download? Iron sights on non-scoped weapons? lol i dont know why but the open in new tab selection is grey'ed out as in, invalid. also at te top of adcraft it says in construction some functions might not work. could this be said function? Make sure you have the latest version downloaded (v0.3.2). If you downloaded the very first version I posted (v0.3) you may have some obscure errors that I overlooked. I have looked into this and there isn't a really good way to do this. The reason that ironsights in other games like CoD look so cool is because they have an animation of the character bringing the gun up to the character's face. Things like this are near impossible to do well in the minecraft engine. I can make it more like Source engine "ironsights", i.e. the guns just zoom in slightly if they don't have a scope. lol i dont know why but the open in new tab selection is grey'ed out as in, invalid.also at te top of adcraft it says in construction some functions might not work. could this be said function? What internet browser are you using? The download button should bring you straight to a file hosted on dropbox. 1: Instructions; what exactly we must do in order to make our own guns? 2: Packaging: To make things a bit easier, you should do ONE gun, the creator, and the mod itself into one download. Yeah, I know, you cant make extra money on having 3 different downloads. Personally, I just want to a pistol. Anyway nice mod.. Rifles here i come.. Uh oh??.. I put rifle in heuristix file in minecraft. folder but it nothing shows up when played.. Is there something wrong?? Ok, Two things:1: Instructions; what exactly we must do in order to make our own guns? (and then after making the guns, what else must we do. )2: Packaging: To make things a bit easier, you should do ONE gun, the creator, and the mod itself into one download.Yeah, I know, you cant make extra money on having 3 different downloads.Personally, I just want to a pistol. I will work on a quick tutorial for the creation of guns right now. Anyway nice mod.. Rifles here i come..Uh oh??.. I put rifle in heuristix file in minecraft. folder but it nothing shows up when played.. Is there something wrong?? Make sure it's inthe the ".minecraft/heuristix/guns/" directory (not just .minecraft). At the moment guns don't have a crafting recipe so you have to use them in creative mode (or you can use TMI/Single Player Commands). I need some help. it didn't crash but I looked in the modloader.txt and it doesn't look like it has been loaded. I put the files in the correct place. QUICK TIP TO ANYONE THAT THIS ISN'T WORKING FOR! The .Jar doesn't save the guns as .gun, you have to find the file after it is saved and rename it with .gun at the end. My guess is either a conflicting mod or you installed it wrong.